No doubt, one can mistakenly delete important files, documents and/or archives from a PC. These actions most time happens accidentally or caused by careless operations by a novice. It can be very painful if the data lost is a very important one. Today, We’ll be writing about EaseUS Data Recovery Wizard; a freemium Data Recovery software that lets one retrieve lost/deleted files. EaseUS is a popular software vendor with lots of PC/Mac utility apps to its credit. The company specializes in developing utility software that aids in disc managements, data backups, data recovery and etc. 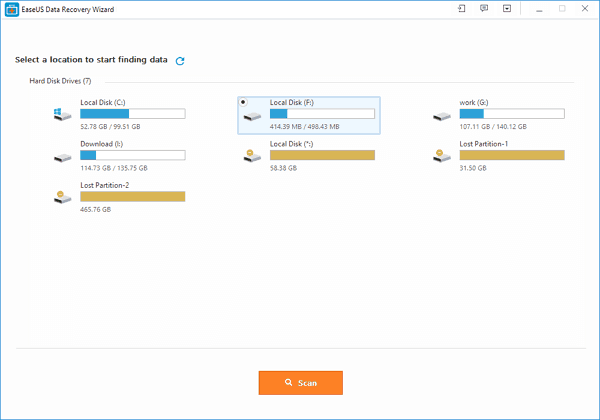 EaseUS Data Recovery Wizard Free is a software that can retrieve your lost data from PCs, PDAs, partitions, USB flash disk, digital camera, and memory card. It recovers your lost data in just three steps -> Launch, Scan, and Recover. Ransomware and pronounced cyber-attack rose to a tremendous height this year alone. Affecting millions of internet users world over. EaseUS free data recovery software can help out for recovering files that are corrupted by one form of cyber attack or the other. 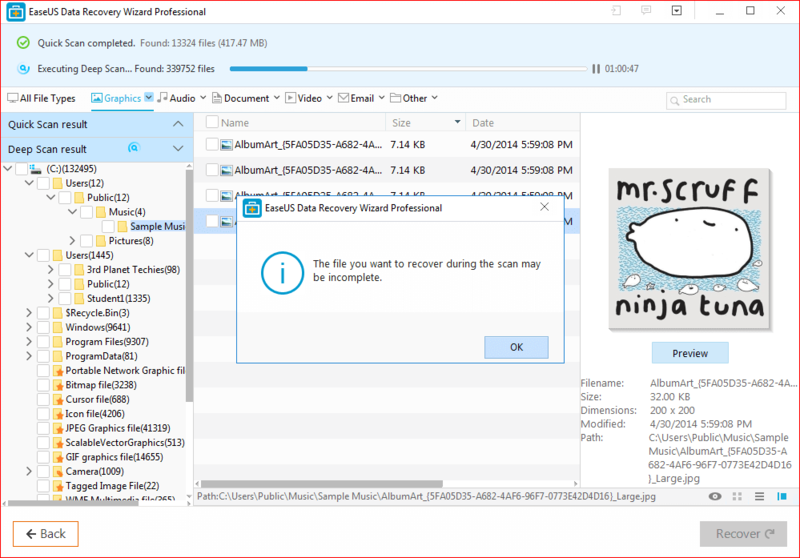 EaseUS Data recovery wizard comes with three versions, viz; Free, Pro and Pro+WinPE version. The free version can recover lost files up-to 2GB (max), while the other versions can recover all deleted files without the data size limitation. EaseUS can recover lost data from memory cards, USB flash disks and external storage devices. There is always this crazy friend who would keep playing with your memory card and might carelessly format it not knowing you’ve got important files stocked into it. Ever got into this kind of situation? EaseUS data recovery tool can be employed for your files’ rescue. Recovers lost/deleted files including exFAT, FAT, RAR and ZIP files. Download EaseUS Data Recovery Wizard from their official website and install it to your PC/MAC machine. Launch the app after installation and continue with the scree options for the next step. When the software is successfully launched, USB disks, drive partitions and hard disk drives available on the PC will be shown. If a partition was previously deleted, EaseUS Data Recovery Wizard will detect and display it as a “Lost Partition”. A scan button is located at the middle-bottom section of the active screen. It is used to trigger the scanning for deleted files, before clicking on the option to recover them. Select the partition (hard disk drive or external storage device) with the lost files, then hit the “Scan” button to start the process. Click on recover button and select where to save the recovered data to complete the file rescue operation. This software does not have an option to choose the type of scan you want to be carried out, neither does it allow one to select the exact file type(s) to recover. You just hit the scan button and off it goes. It has two scanning processes- Quick Scan and Deep Scan; first, it starts with the quick scan and then automatically launches the deep scan. The “Deep Scan” looks into every nook and cranny of your PC and gets your lost data back, it takes longer time to complete a deep scan than it would take for a quick one. During our test, the quick scan ran for few seconds while the deep scan completed in 1 hour, 24 minutes. EaseUS was able to recover lost data of about 417.47MB (Quick Scan) and 8.3GB (Deep Scan). While the scanning is still in progress, you can view the already scanned files by toggling through the file tree, click on any document and the preview will appear on the right side bar. Files or documents you deleted personally will appear in the “Recycle bin” directory while the ones lost by other means would appear on the “Other Lost Files” folder. You can easily find a file by using the search toolbar at the top right corner of the preview pane. You can also attempt recovery on selected scanned files. Below is the percentage of data we were able to recover using EaseUS Data Recovery Wizard Pro. From the analysis, EaseUS can be considered a decent enough tool getting back lost/deleted files. Data recovery was very simple and easy with the EasyUS Data Recovery Wizard Pro v11.6. It is a good tool for retrieving lost files. The data recovery rate is quite impressive as it got back 98% of our lost/deleted files (analysis shown above). Unlike some other data recovery apps that are limited to a single file format, EasyUS data recovery wizard is versatile and works for most popular file formats including archives. The after-sales support and timely updates that comes with EaseUS data recovery app makes it a good option for Mac OS X and PC users alike. EaseUS Data Recovery Wizard is available on the company’s official website. EaseUS Free Data Recovery Wizard is completely free to download and free to use, while the Pro version and Pro+WinPE retails for $69.95 and $99.90 respectively. There are many other PC management products from the company, viz: Data Recovery, Partition Manager, Todo Backup, Data Transfer and some other Utility App. Comes with a user-friendly preview pane.